Hungry for mouthwatering ribs in the winter, yet hate the sticky, messy slow-cooker cleanup? Indiana Kitchen Slower-Cooker Ribs are here to save the day. Place slow-cooker bag inside cooker. Slice onions. Place them in the bottom of the cooker. Place the slab of ribs on top of onions. Add garlic, and evenly spread brown sugar over ribs. Turn ribs over several times to coat. Cover, and cook on low for 7 to 8 hours. Remove ribs and onions. Set aside. Toss slow-cooker bag in trash, and replace with new bag. 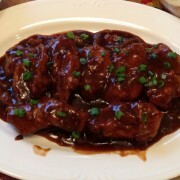 Pour into slow cooker just 1 cup of the barbecue sauce. Add ribs and sliced onions. Cover ribs with the remaining half-cup sauce. Remove ribs, and place on serving platter. Sprinkle with sliced green onion, if desired. Pork. Bacon. Honey. That’s all you need to bring this delish dish to your table. Lay the bacon slices slightly overlapping one another on a cutting board. The width of the bacon should be enough to wrap the length of the tenderloin. Heat the oil in an ovenproof skillet over high heat. Place tenderloin on the bacon. Use a knife to help keep the bacon together, and roll the pork up, finishing with the seam side down. Carefully transfer the pork back into the skillet. Drizzle and brush honey all over the roll. 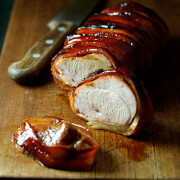 Roast for 25 to 30 minutes, basting once or twice with the pan juices. Remove from oven, and baste again. Let it rest for 5 minutes. Baste once more, just before serving. 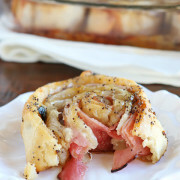 Whether you’re cooking for your family or a crowd, these ham and cheese rolls are delicious and crispy. Unroll the pizza dough onto a cutting board, and press into approximately a 13x18-inch rectangle. Top with ham and cheese slices. Starting on the longer side of the rectangle, roll up the edge tightly. When you reach the end, pinch the seam together, and flip the roll so that the seam is face down. Cut into 12 slices, approximately 1-inch wide. Arrange in prepared baking dish. Next combine the butter, brown sugar, Worcestershire sauce, mustard and poppy seeds in a saucepan over medium heat. Whisk until the butter is melted and the glaze is smooth and combined. Pour evenly over the rolls. Cover and refrigerate for up to 24 hours or bake, uncovered, for 25 minutes until golden brown. Enjoy! 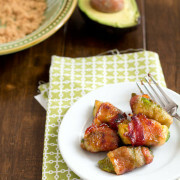 And you thought avocados were just for guacamole! It’s a great appetizer that’ll leave guests clamoring for the recipe. In a small bowl, mix brown sugar and chili powder. Set aside. Cut open the avocado, and remove the pit. Slice 3/4" slices lengthwise then cut each in half. Cut each slice of bacon in 3 to 5 pieces. Wrap each piece around the avocado. Roll bacon in the brown-sugar mixture, and place on baking sheet. Bake for 10 to 15 minutes. Remove from the oven, transfer to a platter and stick a toothpick in each for serving.